“Draw me in your footsteps, let us run,” from the first chapter of the Song of Songs, was the theme for our fall discernment retreat, November 7-10. Three young women from Ohio, Florida, and Louisiana spent the weekend at the monastery in order to quiet and open their hearts to God’s call for their lives and to spend time getting to know us and our life of prayer and hospitality. The retreat consisted of talks, the regular monastic schedule of liturgical prayer, silence for personal prayer, recreation, meals enjoyed together, the Mystery of Holy Repentance (Confession) and Divine Liturgy. Sr. Cecilia spoke about monasticism as a “martyrdom of love” and about the call of every Christian to follow Christ by dying with Him—in the particular way that He calls each of us. Mother Theodora’s topic was “Draw me in your footsteps,” the first half of the retreat theme. She drew on the wisdom of the Church Fathers, other saints and her own life experiences to illustrate the ways that God draws us to Himself. Sr. Gabriella spoke on the second half of the theme: “Let us run.” Looking at the Gospels, she reflected on the meaning of discipleship and the necessity of first being a disciple of Christ while discerning one’s vocation. She pointed out the plural “us” in the verse, showing that our discipleship should draw others to Christ. At the end of the retreat, the young women expressed the peace they had found in leaving all in God’s hands. They especially loved the liturgical and personal prayer and joked with each other saying, “All this could be yours!” Friendships were formed, and no one wanted to go home! 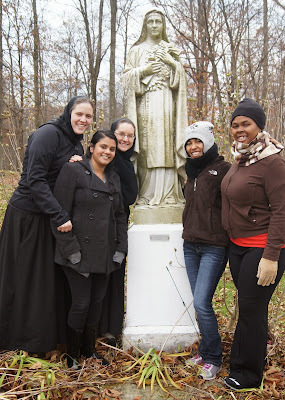 We are considering the possibility of repeating the retreat January 17-20, 2014, for young women who were not able to attend the November retreat. If interested, please fill out the Vocation Inquiry Form (or contact us if you have already filled out the form). beautiful! and many prayers for the discerning women!